Not all kids get to enjoy a white blanket of snow in the winter. Other kids hate the cold and can’t stand to play in the snow. These kids don’t have to miss out on the fun. 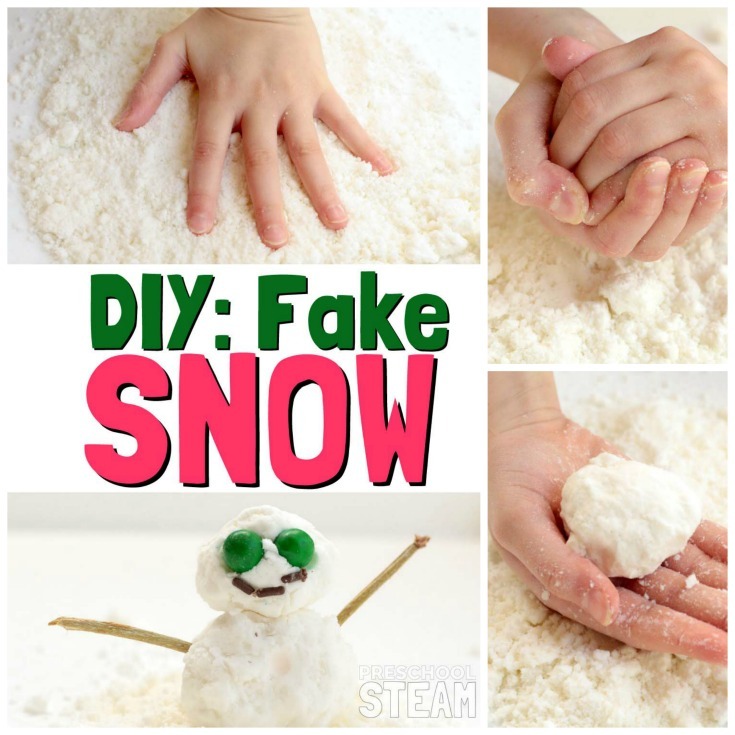 Instead, kids can make their own fake snow. 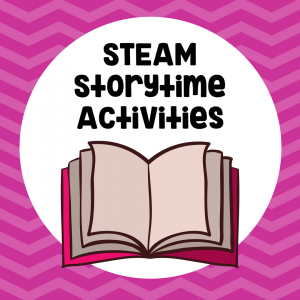 This is a fun winter STEAM activity for preschoolers to do together or alone. Objective: To learn about snow and how different ingredients mix to obtain different properties. 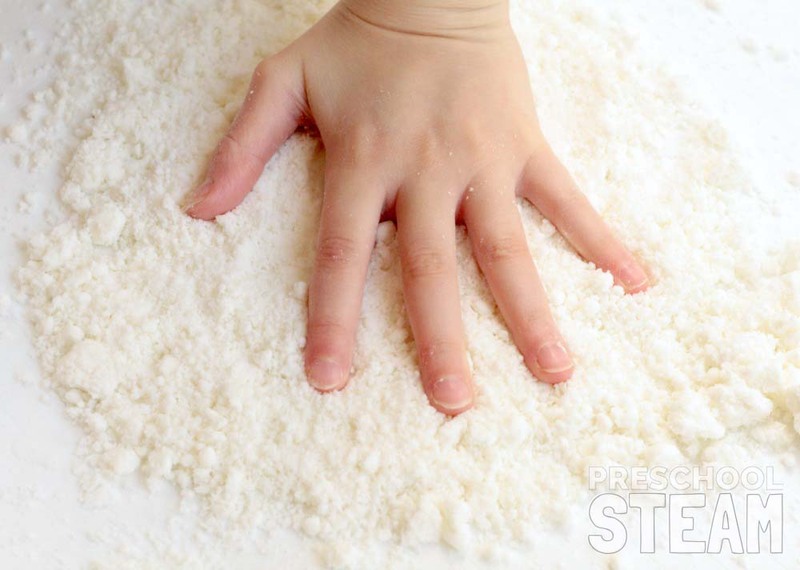 Materials: Large play tray, measuring cup, baking soda, corn starch, sticks, tablespoon, and candy. Ask: Can you make snow? Does snow require cold weather to form? How is snow made? What would happen if you put too much water in the mixture? Learn: Preschoolers will learn about measuring, mixing, how snow is made, and creative thinking. 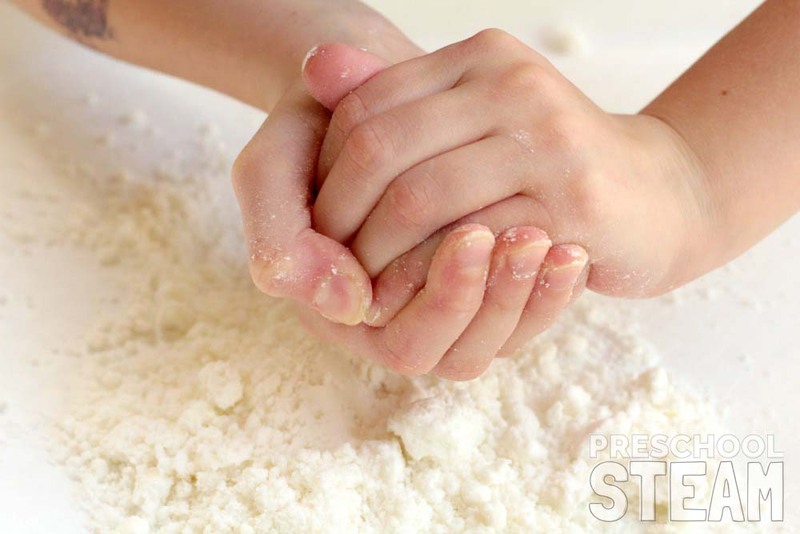 This snow recipe is one of our favorites because it feels and acts similarly to real snow. 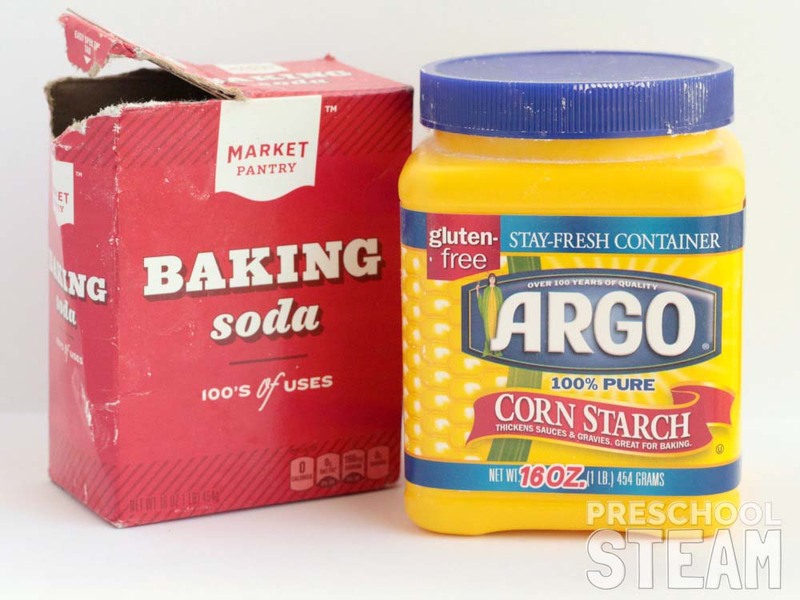 Mix 1 cup of baking soda and 1 cup of corn starch in a bowl. Add water, one tablespoon at a time, mixing with your hands. 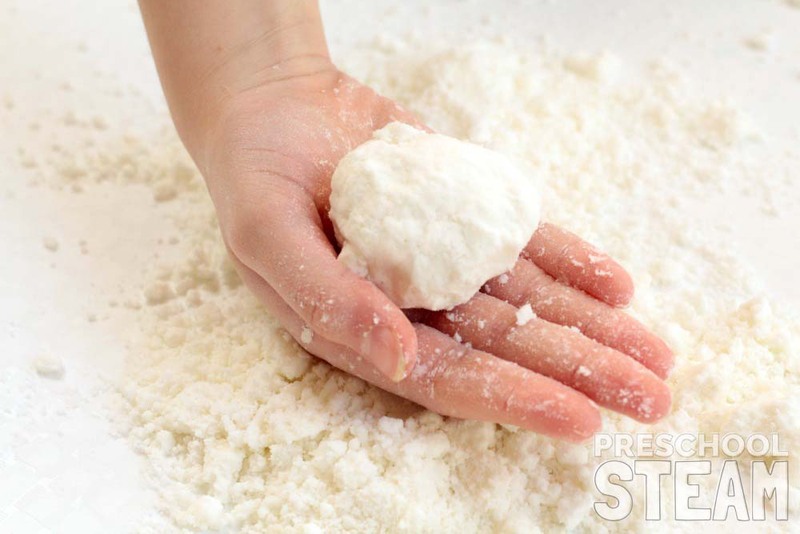 Keep adding water until the mixture can just hold its shape when squeezed in your hand. If you add too much water, it will liquefy. If this happens, you can always add a bit more baking soda. 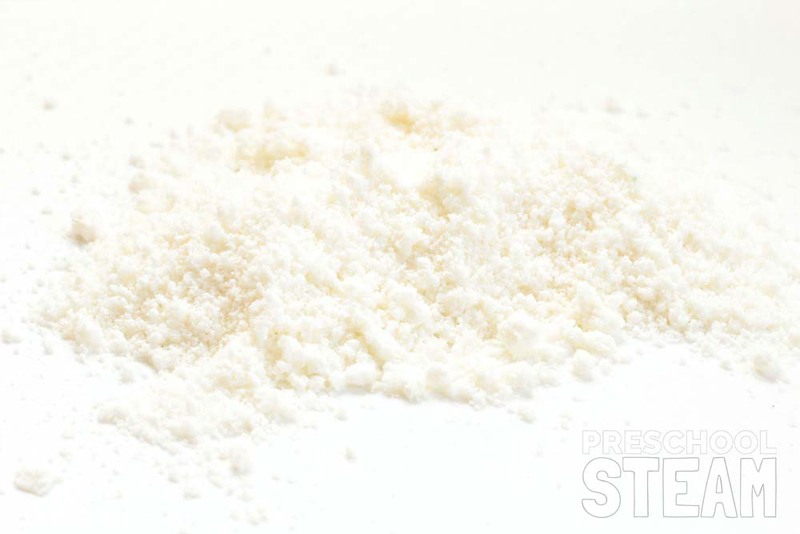 I like to add corn starch to the mixture because it helps the snow hold its shape better than just baking soda alone. Once the fake snow clumps up, give it to your preschoolers. They will love just playing with it at first, which is when you can talk about the science of real snow and what makes this snow different from real snow. Challenge your preschoolers to make shapes from their snow, and build a snowman! 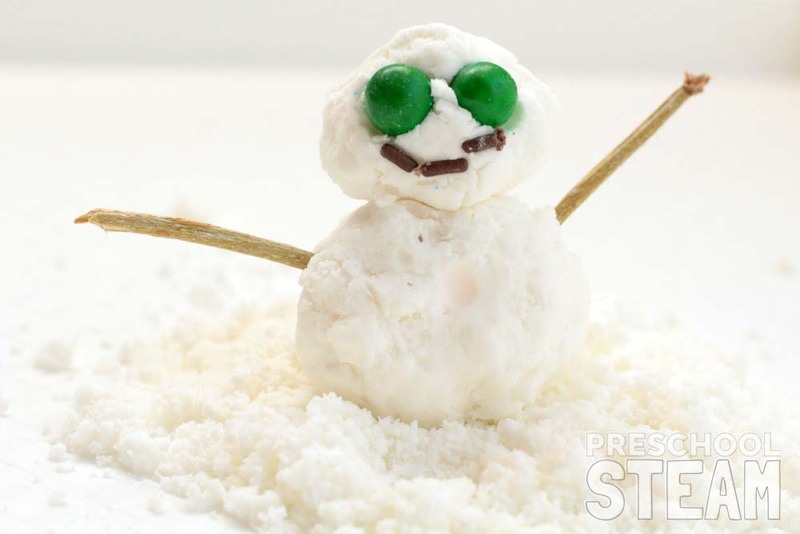 Use sticks, candy, and other small toys to build your snowmen the same way you would in real snow. Only this snow is better, because it doesn’t freeze your hands! 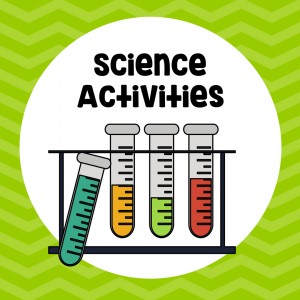 Science: Discuss with kids how real snow is made, and why the mixture of baking soda and corn starch acts similarly to real snow. Technology: Talk about how meteorologists use technology to tell when it will snow. 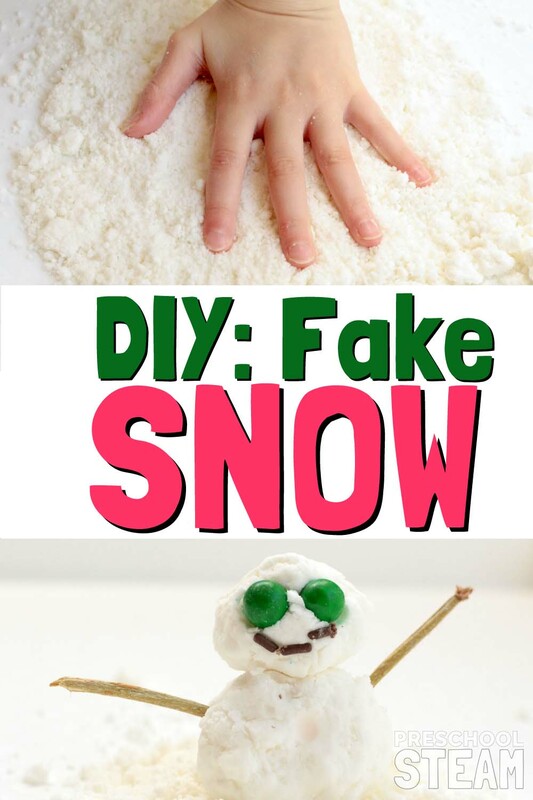 Engineering: Kids are able to use the basics of engineering to create their snow recipes and build things from snow. Art: Use cookie cutters to make shapes in the snow and build faux snowmen! I'm Jamie a STEAM educator and certified art instructor with more than 12 years experience. My passion is to show how you can inspire and encourage your students’ creativity through hands-on learning and problem-solving. You do not need to be an artist, scientist or mathematician to make learning fun and engaging for your students. Hi, I'm Jamie a STEAM educator and certified art instructor with more than 12 years experience. At Preschool STEAM we help educators create STEAM experiences that encourage children to be curious, to wonder, to be innovators and to learn through hands-on play.